This is the home, however, not of a dreaming poet, but of a man with a poet's soul united to a practical and executive mind which has been devoted for more than the length of an average generation to the welfare of his fellow-men. He is a man of singular modesty, of gentle voice, of winning old-school courtesy, of sensitive sympathies. and a great all-enveloping heart. Although the whitened locks about his kindly face tell something of the four score and three years which he had seen, yet his unimpaired faculties are still developed daily to the service of human brotherhood, and the unabated warmth of his human sympathy makes sunny the autumn of his beautiful life." click on the gates below! 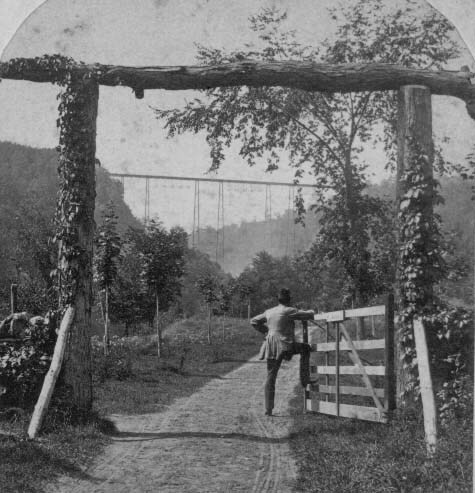 Exploring Letchworth Park History is the personal website of Tom Cook & Tom Breslin. It is not affiliated with Letchworth State Park, the Genesee State Park Region, or New York State. All rights reserved by Tom Cook & Tom Breslin.